I was thinking about something meatloafy today when I thought, hey. I don’t LOVE meatloaf, so what would make me love it? Hmmm… Think, think, think. Thinkety think think. So I put on my thinking cap and I thought about a pizza loaf, buuuuut I do so much with pizzas already. So I decided I really wanted something Mexican instead. I put together some ingredients I thought sounded really nice while I was in the kitchen (very scientific, no?). This is a deliciously beefy-zippy-fun concoction makes a filling dish that’s still light and fresh enough to serve on hot days. 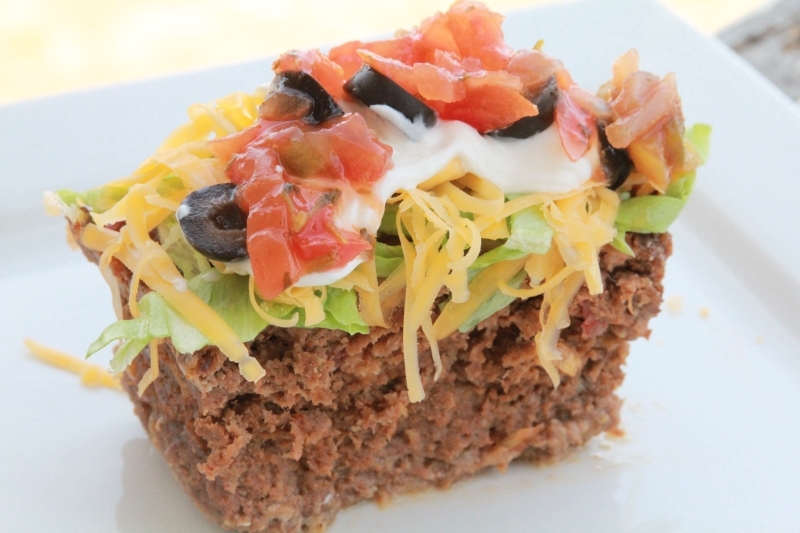 It’s like taco meat in a convenient, easy to carry loaf case. Helloooo Mr. Takealong Taco! The seasoning you use will mean your carb counts will vary slightly. Since most packets contain roughly 20 carbs, I’m adding those 20 carbs to encapsulate the general carbiness of the packets.If you make your own spice, you can cut those carbs in half. 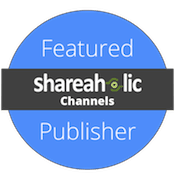 I use Simply Organic–(check the link for their store locator). Use a quality salsa. If you go with a liquid salsa, you’re going to have issues with watery meatloaf, and we can’t have that. I buy a refrigerated, chunky salsa. If that’s too spendy, you could pour the liquid off of Rotel or your salsa and use the solids. I use cheddar cheese, but pepper jack would be a super spicy, fun treat. If you want extra spice, you can use an added packet of taco seasoning, but I tried to sub in some zip with the salsa instead since it adds some natural flavor and color for fewer carbs (and chemicals). Be really careful pouring off any hot liquids. Pour away from you. Don’t store the meatloaf with the lettuce on top. The lettuce will wilt and become grainy and unappetizing. Instead, serve the fun sides with the dish, and let people add their own toppings. 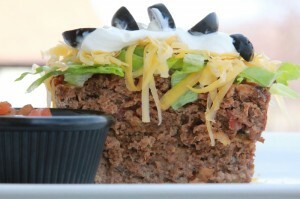 For added fun, set up a meatloaf topping bar, complete with sour cream, guacamole, taco sauce, hot sauce, queso, salsa, black olives, grilled onions/peppers, and fresh lettuce, tomato and extra shredded cheese. This meatloaf is Atkins induction friendly. This meatloaf is gluten free so long as your seasoning is (check those labels!). Need to cut fat? You can sub in a different flour in place of the pork rinds. The pork rinds account for 621 calories and 35 grams of fat (0 carbs). Since the pork rinds are a binding agent and help keep the meatloaf from being too dense, I’d sub in coconut flour, flax seed meal, basically anything that will help that you feel best suits your lifestyle. If you have any questions or comments, please let me know in the comments below. I love hearing from you! 2. Mix all egg, hamburger, seasoning, pork rind flour and 1/2 container of salsa (about 1 cup) until combined. 3. Press half of the meat mixture in a standard bread pan. Cover with 1/2 of the cheese. 5. Press remaining meat mixture over cheese. 6. Bake for an hour or until meat begins to shrink from pan sides. 7. Carefully pour out any excess liquids that might be bubbling around the edges of the dish. 8. Add the rest of the cheese. 9. Cook for five minutes more, or until cheese is bubbly. 10. Let rest 10 minutes and serve. Serve with sour cream, guacamole, shredded lettuce, chopped tomatoes and black olives. Makes 1, 2 pound meatloaf. Serves 8. Per 1/8th serving (sans added toppings and condiments): Calories: 507, Carbohydrates: 4.7g, Fiber: 1g, Net Carbohydrates: 3.7g, Protein: 33, Fat: 29g. i can’t wait to try this!! YUM! I love this idea, Jamie. And I love you! BRB, going to take two hunks of Costco ground beef out of the freezer. Oh man, i love meatloaf ,but my family hates it. Oh well,i think they’ll have to suffer tonight cause mama is making meatloaf for dinner ! The cool thing, too, is that the meatloaf translated into so many other uses as leftovers. My kids gave me the stink eye, too, but they’ll cope. Jamie, I just found your site somehow. Have you ever considered a switch over to the Dukan diet for a change of pace? I would love to see what you could do. I have been using your oopsie roll recipe (although it was called something else) for a while now. I am glad to finally find the origin of a recipe I use weekly on my diet journey. I had your chicken/cheese pizza crust for dinner tonight and I am in the best food mood I’ve been in for a long time. 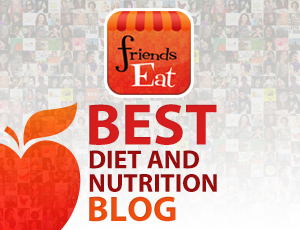 Many of your recipes are already Dukan friendly. Keep up the great work. I have not considered switching, but I have a great respect for the low carb diets of varying kinds! I have friends following so many low carb plans, and I love many of them. The DUKAN diet is not half of what Dr. Atkins’ is! I have downloaded the full recipe app onto my i pad…and deleted it!….I was curious!…and now I do not want it at all taking up memory! The recipes are not appetizing at all. Fat free cheese…oat bran everywhere…skim milk…no cream and all the great cheeses we enjoy here! Jamie, sweetheart, do not switch, please. DUKAN is a pale facsimile of the deliciousness of what a low carb diet should be! After all, with your love and guidance, there is absolutely no need to ever not eat the Atkins way…it is delicious, healthy, and a way of life we all can embrace for the rest of our lives. Jamie, simply just go on being you! You are wonderful. Hi, Gladys! I have always been an Atkins girl (since the early 80’s) and I don’t plan to change anytime soon. I am so pleased, though, when low-fat friends find me and can benefit from the low glycemic aspects of the recipes. That makes me so glad. First and foremost, I want to help everyone enjoy healthy, whole foods with a modicum of healthy, saturated fats. Beyond that, I want to support peoples’ chosen ways of eating, even if they’re not what I follow. I need fat or I starve, but I have friends who feel ill with fat and have to keep their amounts lower in general. Thanks so much for your kind words! I appreciate your support. I offer my deepest, most sincere and humble apology if I offended, you or your reader. Yes, I agree, all low carb diets, if they fit the users lifestyle, are far superior than eating carbs that kill. I am like you, Jamie, I need the fat, not only for flavour, but to feel well fed. I must stick to Induction level eating to lose at all. Therefore, I am continuously searching for new ways to cook, for I usually fall into the trap of always cooking the ‘same old thing!’ …which is boring…and boring is the temptress of craving carbs! No worries! We should all be able to voice what we have to say. I think you’re wonderful. I just wanted to let it be known that I tend towards a diet with saturated fats, in case anyone had questions. It keeps my blood sugar most stable. Thank you for your most gracious understanding. Losing is hard work…and I have a wonderful sweetie in my life who actually believes that too much protein is bad for us…he loves carbs. He eats potato and rice in the same meal…and enjoys all carbs…especially at midnight, when he is hungry, again. He is forever lecturing me that what I eat is wrong! Yet, I slowly melt away, and have more energy than ever! Plus my HDL is through the roof…..eating bacon! Let’s all be well, and the best we can be! I made this tonight and served it with shredded lettuce, sour cream, and diced tomatoes. It was Very Good! My family loved it too. I had 4 pounds of ground beef I needed to use so I doubled the recipe and made two loaves–good thing we all liked it so much! The extra one will be going into the freezer and we all look forward to repeating this dinner soon. Thank you! I made this for dinner last night, sort of. I forgot the taco seasoning, but the salsa gave it so much wonderful flavor! I may try it again using a homemade pico de gallo or half pico half salsa. It was so juicy and moist. The best meatloaf I’ve had in years! I LOVE that you loved this dish even without the taco seasoning. I’ll bet guacamole would zip it up, too. The taco seasoning isn’t actually mentioned in the recipe, so I can see how it would be easily forgotten. Maybe you can edit it in? Hi there! Done, and thanks for letting me know! I add it to the meat mixture with the pork rind “flour”. Looks amazing! Where can I find the pork rind flour…? Hi, Josh! You make it one of three ways: 1. You can put pork rinds through the food processor and turn it to flour; 2. You crush pork rinds in a sealed, gallon zipper bag until it reaches a flour consistency; or 3. You drive over the bag with your car (Your Lighter Side maintains no liability regarding driving over food products with automobiles). My husband has just alerted me that if he was single, his preferred method of making pork rind flour would be to place said bag of sealed pork rinds into pillow cases. Then invite your favorite Victoria’s Secret models over for a pillow fight, creating all the pork rind flour you could eat. Note to self: Husband will never be single. Is there anything else that can replace the pork rind flour? Hi, Donna! In place of the pork rind flour, I’d go with either grated Parmesan cheese or flax seed meal. will be using that too!! YUM! I cant wait, thank you once again for coming the rescue. What is the purpose of the pork rinds? Is there a substitute for them? The pork rinds act as the breading. You can omit them if you’d like. To use flaxseed do you use the same amount as you would the pork rind? That seems like A LOT of flaxseed?! You might be able to cyut the flax seed meal in half since it’s so absorbent! Good question! A cup of flaxseed meal was perfect! The meatloaf was delicious! It didnt have any ‘juice’ to pour away, so the flaxseed must have soaked that up and kept it nice and moist. It was really really tasty. Awesome! I am glad. I was hoping it wouldn’t be too much. Thanks so much for letting me know, Laura! I have been on the Low Carb diet for quite sometime and am so sick of the same old food. I love these recipes on here. Hi, Sara! Thanks so much for your kind words! I process the pork rinds in my Ninja food processor, but you could also process in a sealed Ziploc bag with a rolling pin, and it works wonderfully! I get sick of the same foods, too. I am always looking for something different to try. Actually i was just doing some research and its looks like i can buy Flaxseed and grind it up instead of using the Pork Rinds? I can not find anywhere to buy Pork Rinds. I still do not know what it is. Hi, Sara! Pork rinds are also known as chiccarones. http://en.wikipedia.org/wiki/Pork_rind You could try flax seed meal instead, absolutely! I am so glad to hear that, Stephanie! Thank you so much for taking the time to let me know. I fully intended to bake this Mexican Meatloaf for dinner today, however, time flew by and I just did not have the energy to cook! But, gee, I had been craving the Mexican flavours all day! I really pushed myself and in what can only be called hunger desperation…otherwise known as the need to eat…I took a huge cooking shortcut and created the following.,.just had to share! City of Detroit, Michigan…the Detroit River is a jewel tonight all the lights are bouncing off the water. The skyline is a true thing of beauty. 2 Tbsp finely diced and chopped bell pepper…that was all I had! 1 tsp extra virgin olive oil…only because the meat was extra, extra lean. Formed one huge patty…about 7 inches in diameter. Forgot the garlic, silly me, so I didn’t want to ruin this creation, so I liberally, ok very liberally, sprinkled garlic powder all over the top of the burger, and wet the garlic with a few drops of Worcestershire sauce. Served it up on a bed of very crisp, very cold iceberg lettuce. Ate it with a fork and knife! Now I wonder if I can make a patty with salsa incorporated into the meat? Ok, slightly drained salsa! Especially of I am using extra, extra lean beef…this will add tenderness as my bell pepper did! 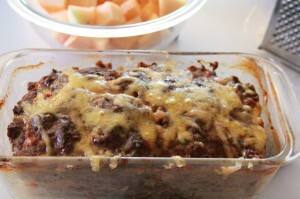 I promise to bake your unbelievable Mexican Meatloaf asap! I hate pork rinds and can attest that I’ve never noticed the rinds at all. You could use flax seed meal instead if you prefer, though. I make something similar once or twice a month. I omit the taco seasoning, and add 2 tubes of chorizo and 6 ounces cream cheese (very soft). I also make a version that is ground chicken and three tubes of chorizo, cream cheese, cheddar cheese, cilantro, two eggs. Or the other way around…. I love your blog and use it for recipes and to spark ideas all the time… I am doing LCHF or keto and just hit the 110 pound loss mark. Way to go on your amazing losses! We need to kibbitz about cooking. I am obsessed with food and with losing weight. And food. And food. Thank you for telling me how you prepared your dinner. It sounds positively delicious! Pork Rind Flour?!?!?!?!?!? Freaking genius!!!!! Love this site, I am new to low carb and I love seeing all these recipes! We are taught all our lives that high fat foods are a no-no so we deprive ourselves of all the things we crave like cheese, bacon, cream, etc…. Now that I’m eating low carb I am enjoying food so much more! I don’t feel guilty when I leave the skin on my chicken or smother a burger patty in cheese and bacon and I don’t miss starchy foods AT ALL! 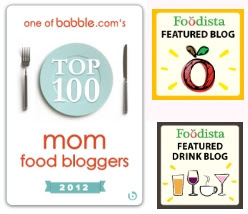 Thank you so so much for an awesome, easy to navigate site with hundreds of recipes and great information!!!! I LOVE LOVE PORK RINDS. have been using them for at least 2 years instead of breading on things; I find them mostly in the isle with the potatoe chips and grind them up in my blender. I forgot to add in my comment above that I used 1 cup of flax seed meal because I was pushed for time, and didn’t want to crushed pork rinds. Just found this interesting site! Curious to try this meatloaf but wondered if TVP granules (textured vegetable protein) could be substituted for the pork rinds? This was the bomb! Absolutely delicious!!! Don’t know where you get pork rind flour. Used flaxseed flour and it turned out fine. Thanks for another low carb recipe.